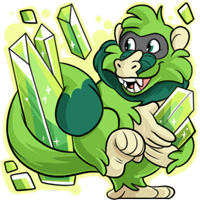 The Crystal Pets are making another Amourok push! Sharp, stunning, and elegant, this Crystal Audril Morphing Potion shows exactly what Team Crystal is fighting for! Show your love for all things Crystal, and find the new Morphing Potion in the Snow Jar Igloo permanently, as well as in the I.C.E Shop until the end of the month for 500 IceCash (450 IceCash for Gold Account members). Love the Crystal Audril's look!! I agree with @RiverStarr This is a most stunning audril! Finally justice and honor shown this species is a beautiful way! In your face, Team Plush! The solid black eyes seem unintentional? Every other Audril has proper irises and pupils! But I love the colours here! They're probably my favourite colours out of the Crystal pets so far.